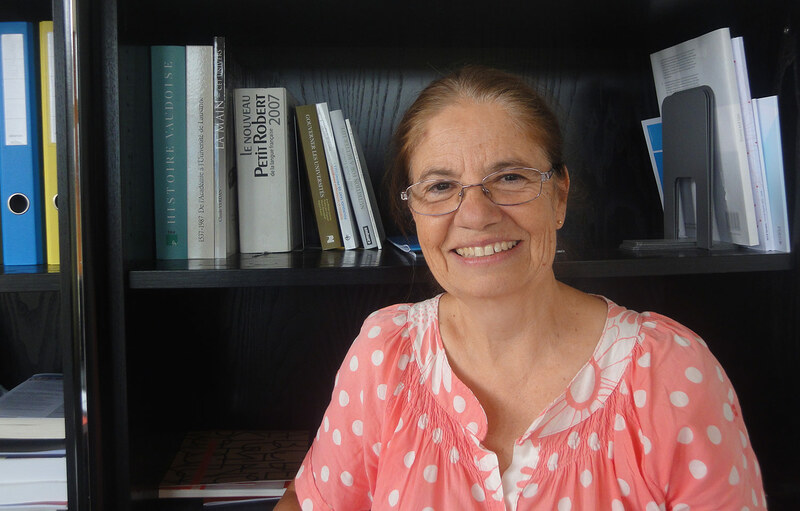 “I wasn’t there when it happened” says Prof. Nouria Hernandez, “but it’s only reasonable to assume that RNA polymerases were playing an instrumental role during the early stages of cellular life.” And who would dare to contradict her? Indeed, the synthesis of macromolecules following molecularly embedded instructions in a DNA or an RNA template – call it genetically encoded “chain building” if you want – is an essential process of life on this planet. Prof. Hernandez and her team are focusing on RNA polymerase III, responsible for the transcription of small non-coding RNA genes. Their research has revealed unexpected levels of complexity for polymerase III regulation, thereby challenging prevailing concepts in the field. – Prof. Hernandez, could you briefly comment on the kind of research work that is being done in your team? NH: Our laboratory is conducting research on the mechanisms of eukaryotic transcriptional regulation. We have been concentrating our efforts on RNA polymerase III (pol III) – less studied than RNA polymerase II, which transcribes protein-encoding genes –, an enzyme transcribing short non-coding RNA genes involved in various essential cellular processes. For many years we have been focusing on identifying the transcription factors required for pol III activity in trying to understand how it is regulated. – Could you give some examples of RNAs that are synthesized by pol III? * 7SL RNA, a component of the signal recognition particle, an evolutionary conserved ribonucleoprotein complex that targets specific proteins to the endoplasmic reticulum. * Gene regulatory antisense RNAs, as well as various micro RNAs and small nucleolar RNAs with, in many cases, a hitherto unknown function. – RNA polymerases perform transcription in all living organisms. They must have been there from the “very beginning”, no? NH: It depends on what one calls the “very beginning”. RNA polymerases I, II and III are part of the multi-subunit RNA polymerase family, whose members are related to each other and evolutionary conserved. If you compare the sequences of RNA polymerase subunits, you can immediately see – and believe me, there is no need for sophisticated sequence comparison algorithms – that these subunits are highly conserved between archaea, bacteria, fungi, protozoans, animals and plants. So, indeed, it is only legitimate to assume that the last common ancestor of prokaryotes and eukaryotes must have had cellular functions involving RNA polymerase activity. But if you think of the “very beginning”, then self-replicating RNA molecules may have been there before RNA polymerase proteins. NH: When I came to the CIG, I had the opportunity to study pol III-controlled transcription at a genome-wide scale, using high throughput sequencing technology in collaboration with Keith Harshman. One of the first questions we tried to answer was a relatively simple one: “Are the transcription factors we have identified as being essential for pol III function actually used by all pol III transcribed genes?” The answer to that question is yes, which actually did not come as a big surprise. However – and that was a surprise, indeed – our studies on pol III occupancy revealed that many pol III annotated genes, including many tRNA genes, are in fact silent: their expression was below our detection limit, although we could demonstrate that these genes had a functional pol III promoter. – Why was this puzzling? NH: Because in those days it was generally accepted that pol III genes are all co-regulated, being transcribed at high levels in growing cells – in need of large amounts of newly synthesized proteins – and at low levels in resting cells. Our results challenged this hypothesis, by demonstrating that some of these genes were silent, whereas others were not under a given physiological setting. Later, we could demonstrate that some of these “silent pol III genes” were actually transcribed under certain pathological conditions, namely in mouse hepatocarcinoma cells. – We are talking about cancer. NH: Right. As you know, deregulation of cell growth control is widely recognized as a key event in cell transformation and tumorigenesis. It is quite possible that expression of some of these “silent pol III genes” in cancer cells is linked to aberrant genome reorganizations, such as irregular “opening” or “closing” of chromatin associated with RNA polymerase II- driven transcription in these cancer cells. As a matter of fact – as soon as it became clear that not all pol III transcribed genes are co-regulated – a theory has been formulated, stating that the activity of RNA polymerase II promoters “folds” the chromatin landscape and can determine which pol III genes are transcribed. Now, this has indeed been demonstrated in some cases, but we have observed pol III genes in the vicinity of active pol II genes which are not transcribed and vice-versa. – So, there is more at hand. NH: Oh yes! We do not have all answers yet, but our results raise the possibility that these “silent pol III genes” may be expressed in some tissue, at some time point when there is, for example, an exceptionally high demand for newly synthesized proteins – not only in fast growing cancer cells but also under non-pathological conditions. – Your team has made major contributions concerning the regulation of pol III genes. You already came to mention this concept of co-regulation, which you have challenged. Let’s focus on that for a moment. 3) gene external promoters, which we have studied, that control transcription of genes encoding U6 RNA, RNAse P, RNase MRP, 7SL RNA, and other small RNAs. – … whereas transcription of other pol III genes is abolished. NH: Exactly, pol III repression under unfavorable conditions is not global: some genes, that are probably essential for cell survival, remain highly transcribed under all physiological conditions. – Could you comment on the nature of these genes? NH: For example, genes encoding tRNAs of all isotypes remain transcribed, thereby allowing the cell to synthesize any protein. Another of these pol III genes encodes U6 RNA. This makes sense, as splicing is a vital process. And then there are several small RNA genes – which are highly evolutionary conserved – of unknown function. NH: Much of our current work is focused on MAF1. Ian Willis at the Albert Einstein College of Medicine in New York – with whom we are collaborating – showed that MAF1 is essential for repressing pol III activity in response to a wide variety of negative stimuli in yeast; yeast cells lacking MAF1 are incapable of repressing pol III. We have shown that MAF1 has the same function in mammalian cells as in yeast. In trying to untangle the regulation of pol III by MAF1, we constructed MAF1 knock-out mice. Now, as I already came to mention, pol III activity is increased in strongly dividing cells and abnormally enhanced in malignant cells. Consequently – in all our naivety, I must add – we expected MAF1 knock-out mice to show strong phenotypes, including an elevated susceptibility to develop tumors. – Prof. Hernandez, I can hear in your voice that this was not the case. NF: Indeed, nothing of the kind we expected was happening! For some time, we could not even observe any obvious phenotype, until we realized that MAF1 knock-out mice are leaner and have much less fat than their wild type counterparts. So, these mice do not only not get cancer, they seem to be in perfect health: they are resistant to diet-induced obesity and even have a somewhat longer lifespan. NH: But there is another side of the coin, you know. For example, the lean phenotype of MAF1 knock-out mice reflects their increased energy expenditure and metabolic inefficiency. Moreover, fat tissue has essential functions in an animal and removing major parts of it will most likely be associated with systemic consequences. But, of course, the important question remains: “How to link de-repression of pol III controlled transcription to the observed phenotype in mice?” I must say that we do not have all the answers yet. For example, it is highly intriguing that removing MAF1 in Drosophila leads to bigger embryos, a phenotype which is easy to rationalize: alleviating MAF1 repression of pol III transcription will drive the translational machinery towards making more proteins, and therefore bigger cells. – Whereas you observe the opposite phenotype in MAF1 knock-out mice. – …now you’ve made me curious. NH: As you know, the chemical structure of tRNAs is post-transcriptionally modified, in particular the anti-codon or adjacent ribonucleotides, a process which is vital for the proper function of tRNAs. We believe that – following a dramatic overexpression of tRNAs, as observed in MAF1 mutant mice – the tRNA modifying machinery is overwhelmed, thereby modifying a lot of tRNAs incompletely and rendering many of them non-functional: hence a compromised translation in cells lacking MAF1 repressor. Of course – if our working hypothesis turns out to be true – this would imply that MAf1 regulation of pol III function is very complex: reducing MAf1 activity versus destroying its function completely might result in opposite phenotypes. So, in trying to provide answers, we are presently studying MAF1 function in cell lines, which are easier to manipulate and to study. A new therapeutic target for the treatment of obesity? – Prof. Hernandez, your work is leading you, at least partly, into metabolism and metabolic pathologies. Could this imply that your research might have clinical relevance? NH: The challenge we are facing is that we do not truly understand – not at the molecular level, not at the physiological level and not at the systemic level – why a MAF1 knock-out mouse does no longer accumulate fat. The question we have to answer is why these animals remain slender under all dietary conditions we have tested, even when put on a high-fat diet. In this context, it is important to note that all cells in these mice are lacking MAF1 function. Presently, we are removing MAF1 from particular organs – from the liver and from white or brown adipose tissue – and analyzing the phenotypes, in search for explanations. So, to answer your question: yes, I could imagine that MAF1 might become a drug target in the treatment of obesity, but it is far too early to make statements on that matter.